Shaker style electric adjustable bed is white with waxed tops. Comes with a Reflex mattress. The bed has plenty of room for a bed table or a hoist . This electric adjustable bed is a hand crafted mahogany bed, and as you can see is absolutely stunning. Wooden adjustable bed with high quality Reflex mattress removable washable cover. The Barden bed can also come with a low foot-end surround. This beautiful oak adjustable bed with its sleek lines and soft grain would be a great addition to any bedroom, simple in style and great on the eye, you can have matching oak bedside tables if you wish. Beech / maple effect bed with high quality reflex mattress and removable washable cover. This adjustable bed is sleek, and has a removable washable cover. A solid pine bedstead with ornate head and foot end which can come in a low or high style. A superb bed with ample room underneath for storage, bed table or hoist. 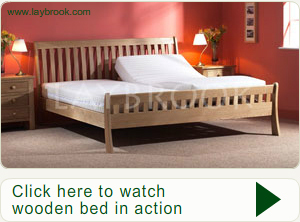 The latest addition to the Laybrook family of adjustable beds, a pine bed with beautiful contemporary styling. Comes with a Reflex mattress. Made from the finest oak, it has been left to dry for one month before being used to create this beautiful bed. This is a stylish bed that not only looks distinctive and unique, but has a modern twist that will inspire.